Finally, there is a bigger, roomier Prius that accommodates families and all their belongings, and it's called the Prius V. But what is the Prius V exactly? It's considerably bigger than a sedan, smaller than an SUV and sportier than a minivan. The answer may surprise you - the 2016 Prius V is a letter-day station wagon! It has the ground clearance and agility of a sport-tuned car, and of course the legendary eco-sensitive hybrid system that thumbs its nose at gas stations. Here at Venice Toyota, we applaud the station wagon's revered place in American pop culture, and we welcome the elongated and streamlined Toyota Prius V with open arms. We made sure to acquire a large selection of 2016 Prius Vs because they are becoming very popular with young families and suburban couples. They appreciate the combination of a spacious interior, peppy acceleration and Prius' legendary fuel economy. Come to our modern showroom at 900 US HWY 41 Bypass S in Venice, FL, and treat yourself to a test drive of the all-new Prius V. It is unlike any station wagon you have ever driven. App Suite forPandora, iHeartRadio, etc. The roomy Prius V gives you a jaw-dropping EPA-estimated 42 mpg combined rating, far better than any other family-hauler we know of. You can do your part to make the Prius V even more fuel-efficient by choosing the driving mode wisely: ECO mode is the default setting that combines electric and gas power in a synergistic reaction; EV or Electric vehicle Mode lets you switch over to battery-only power for up to a mile at a time; and SPORT mode provides a boost of internal combustion action that will remind you of bygone muscle cars. You may find yourself reaching for the SPORT mode button every time your favorite Southern rock anthem comes on Pandora. More power to you! Technically speaking, the 2016 Prius V is an MPV, or Multiple Purpose Vehicle - but we know a station wagon when we see one. Whatever happened to the station wagon, once the darling of American family life? It morphed into the minivan, and here's why: Back in the 1930s, trains were the a very elegant way to travel, and the elongated sedan built to transport people and their suitcases to the train station delighted Americans. (Hence the name "station" wagon.) It evoked feelings of adventure, and signaled the beginning or end of an exciting trip. In the 1980s, the same thing happened with air travel. People loved the luxurious minivans that shuttled them to and from the airport, and the era of luxury SUVs began. Today, the Prius V has all the advantages of the station wagon and none of its drawbacks. Anytime Prius launches a new model, the industry is abuzz. Here at Venice Toyota, located at 900 US HWY 41 Bypass S in Venice, FL, we have not seen as much interest in the Prius family since it was first introduced in 2000. 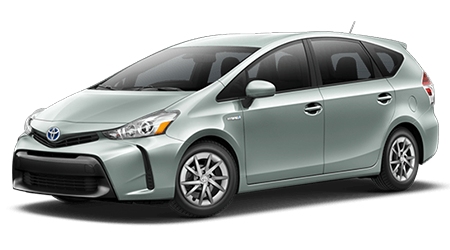 There are now several Prius models to choose from, including the original, the compact Prius C, and now the large Prius V. Every Prius is equipped with the latest safety features including advanced airbags and the new V is as safe as a fortress on wheels. Our service area now includes Sarasota, Bradenton, Venice, North Port, and Port Charlotte, so everyone is invited to see the versatile 2016 Prius V at Venice Toyota.